When my friend, author Rebecca Black, asked me to review her latest book, I was thrilled. She sent me a free copy of the e-version of the book to share with my kids, and we sat down with it before bed one night to read the story. "Beware the Blackness! A Jellywonker Adventure" is the second in the Jellywonker series created by Black. It follows the adventure of a little Jellywonker named Ted, who loves nothing more than cleaning the ocean and traveling around, learning about his big underwater world. Ted the Jellywonker is joined on this adventure by his friend, Humphrey, a humpbacked whale, and Maud, a motherly pelican. What begins as an ordinary day turns into a long journey, north to Alaska, where Ted learns all about a major underwater mountain range, an unfamiliar habitat, and the effects oil spills can have on local wildlife. 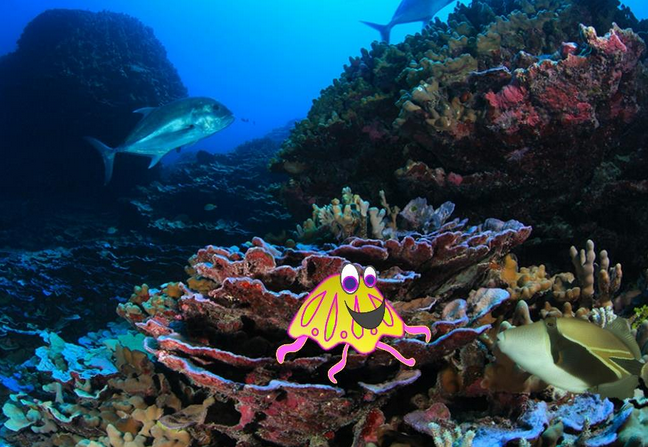 Much like the combination of real photographs and whimsical illustrations, the book combines a fun and adventuresome story with real facts and lessons about ocean life and structures. My homeschoolers like stories that give them enough information about the setting that they can go to a map and learn more. This book does just that. It also provides lots of opportunities for further research, on topics such as sea mounts and underwater volcanoes, aquatic birds, and how people can help address and prevent pollution from oil spills. I liked that the book could be taken simply as a bedtime story for little ones, or read more in depth, as a learning prompt for older students. We look forward to reading more Jellywonker adventures in the future! Pond biology: Who's afraid of a little muck? Last week, my girls had quite an adventure with their best friend. We took a little drive out to the country to visit our friends on their farm. The girls played with the dogs and cats, followed the baby chickens around the yard and helped feed the goats. They even got to watch two young foals playing in the field. Before we left, though, we got out our nets and buckets to get down to the business we'd come to the farm to do. We were there to learn about life in the pond. Pond biology was always one of my favorite subjects to teach as a naturalist, mostly because kids were always astonished at just how much life lurked under the surface of a still pond. In our short time collecting specimens, we found at least two different species of tadpoles, including the leopard frog below and a tree frog that lost its tail the day after we brought it home. 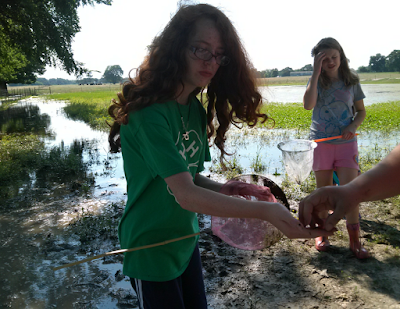 We also found a leech, a salamander and several species of aquatic insects. Who knows how many microbial life forms we brought home in our buckets! Ordinarily, we would catch and release wildlife after observing it for just a little while, because most wild things belong in nature, not in captivity. 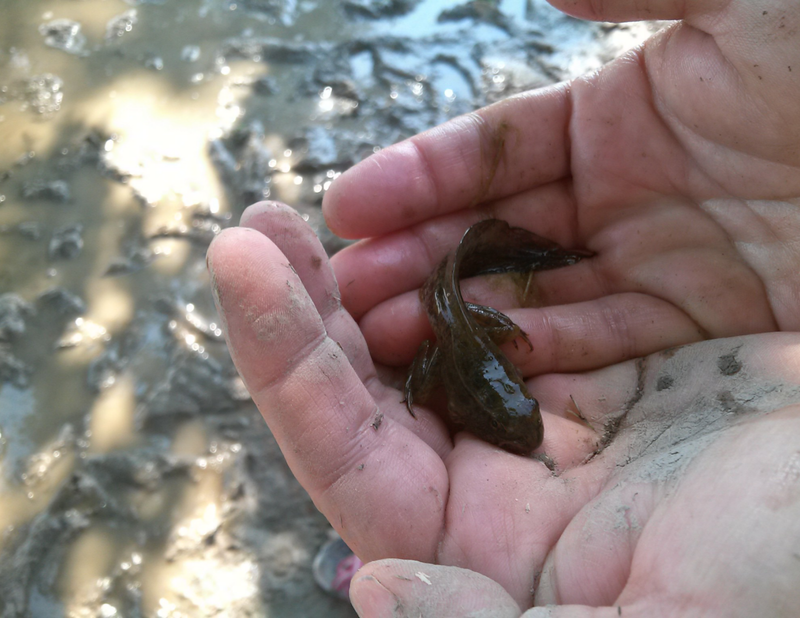 But I felt comfortable keeping the tadpoles and frogs for a while, because I have experience caring for those creatures, and it will be an incredible learning experience for the kids to see them complete their metamorphoses. 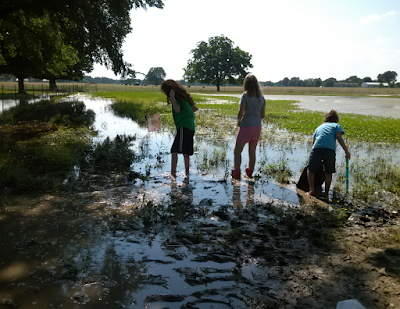 I love these photos of our brave girls, wading in the muck searching for wildlife. 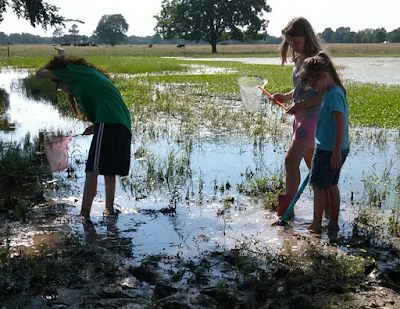 It was a hot and sticky afternoon, and they got tired, but they had so much fun looking for just one more good sized tadpole before calling it a day. You're undoubtedly familiar with daddy longlegs, those incredibly long-legged arachnids commonly found around the outside of houses, among other areas. 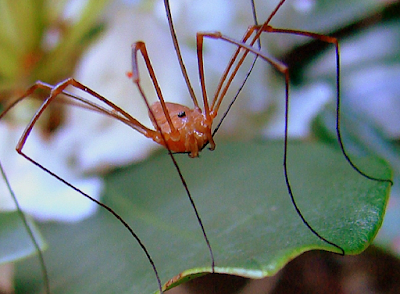 More than 6000 unique species of daddy longlegs throughout the world, but did you know that they aren't spiders at all? Daddy longlegs certainly look a lot like spiders, with their eight legs and their fangs, but the similarities pretty much stop right there. Daddy longlegs are of the order Opiliones, while spiders are of the order Araneae. Both are arachnids, but their many differences make daddy longlegs more similar to other arachnids, like scorpions, ticks or mites. A few key differences include the number of eyes, daddy longlegs have just two, while spiders generally have eight. Also, the lack of venom or silk. 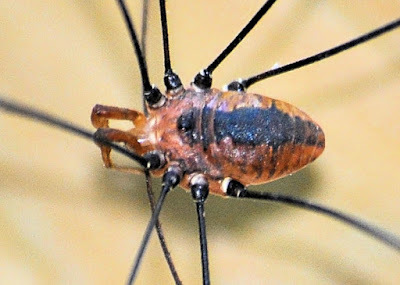 And perhaps most important, daddy longlegs have just one body part, whereas spiders have two, with an abdomen separated from the cephalothorax. To add to the confusion, though, there are some spiders that have gained the name, daddy longlegs spiders, due to their long legs. These species, also known as cellar spiders, do have a separate abdomen and other true spider characteristics. 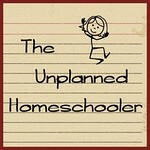 It seems like so many people today are dissatisfied with the homeschool planners on the market. Yes, the most popular planners work for many homeschoolers, but for others they are a nightmare. Bulky books full of pages you don't want to fill out, blanks you'll never use, and price tags that make you wonder what exactly you're really paying for. That's why the free, printable planners found online have been such a tremendous hit. 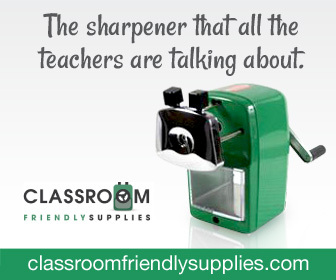 Because you can customize your planner, with just the pages you want and for just the number of students you have. But those can also be expensive, after tallying up the cost of printing all those pages and having them bound. It occurred to me this spring, after publishing my first book, that CreateSpace would be the perfect place to print planners, too. Professionally bound paperback books in a range of sizes, easily formatted to include just the pages you want, printed and shipped to your door for a fraction of the cost of most planners on the market today! Here's how to publish your own homeschool planer on CreateSpace in a few easy steps.